Check braces once a week for anything loose or bent. If a bracket or band comes loose or you break a wire, please call our office at Clemson Office Phone Number 864-654-7534 or 864-888-3113 so that we can arrange an appointment long enough to repair it. Try to explain what has happened by using the diagram provided. Be as specific as possible with the receptionist. If you lose or run out of your rubber bands, call us so we can mail you some more or drop by the office and pick some up. 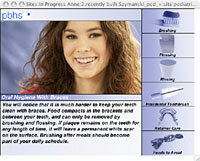 After braces are placed in the mouth it is normal for the teeth to be sore for about 3 or 4 days. Tylenol or Advil will help relieve this discomfort. Some irritation to the cheeks and tongue is normal. Warm salt water rinses can help heal the irritated tissue more quickly. If you feel anything sharp is poking you or any sores are developing, please call our office at Clemson Office Phone Number 864-654-7534 or 864-888-3113. You are responsible for placing the elastics on your braces between appointments. Make sure to wear them as instructed. Remove them only to eat and when brushing your teeth, gums and braces after meals. Then put them back on immediately. Always carry a few elastics with you; so if one breaks you can replace it right away. If your supply is low, call the office and we will mail you an additional supply of elastics. If you forget to insert your elastics one day, don’t double up the next day. Just follow your regular instructions. Elastics can wear out. When they lose their elasticity, they don’t provide the proper pressure on your teeth and jaws. It is very important to change them as directed, even when they are not broken. If your elastics break frequently, a wire or band loosens, or a hook breaks off call our office immediately at Clemson Office Phone Number 864-654-7534 or 864-888-3113. Don’t wait until your next appointment. These problems need to be corrected as soon as possible!